Big confession time here, I am a total wimp when it comes to horror films. And to be honest, I’m not entirely sure why. I do remember being in Pathmark with my mom when I was five or so and having to make sure I didn’t find myself even looking at the front covers of films like Child’s Play and even Silence of the Lambs (moths are freaky looking). I’ve always had an overactive imagination, and if artwork on the box could haunt me before as I lay down to sleep, what would the actual movie do to my brain? Perhaps more importantly, later on none of my friends growing up were fans of the genre, so I was never peer pressured into watching any of them until I was in college. Even then it took Shaun of the Dead, a comedy, to start to make me comfortable with the idea of seeing a horror film. And to be honest, I still have only made a few inroads into the genre. But I’m trying. 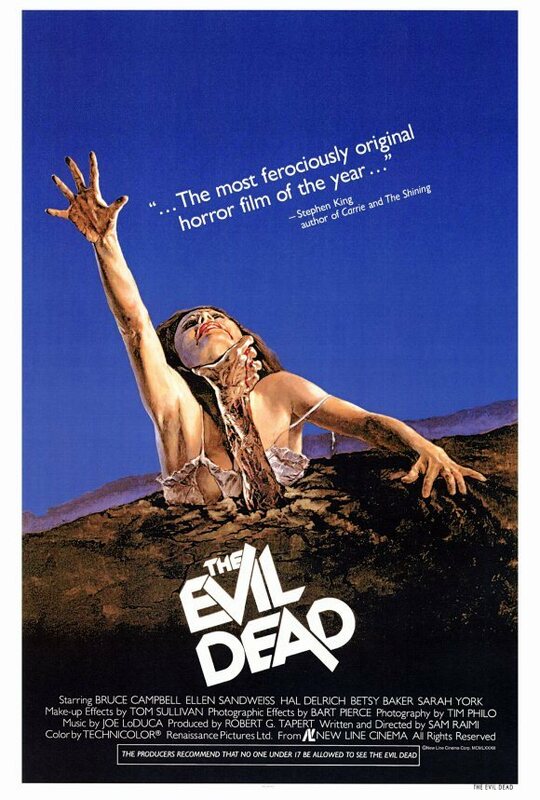 The Evil Dead seemed a rather looming entry on my horror List of Shame, especially since I have seen Army of Darkness. The Evil Dead is a much different film, of course, but I was extremely curious to see the start of the franchise as well as Sam Raimi’s filmography. When I saw Cabin in the Woods last year, I knew there were references to Evil Dead as well as a similar starting point, but I had no idea how much Whedon’s script borrows from Raimi. While Evil Dead itself doesn’t feature an original premise, it features just enough mythology to be especially intriguing, and it is easy to see how this film is the perfect jumping off point. I could see people making the argument that the ultra low budget effects have not aged well, and sure, maybe more realistic portrayals of gore may make this seem a lot tamer than it did in 1981, but I would retort that Raimi’s clever camera work and the enthusiastic performances more than make up for it. From the opening shot of the camera going through the swamp, and numerous closeups, to the climactic passthrough of the cabin, Raimi is clearly having fun trying out different ways to establish the setting and revel in the terror of the characters. Bruce Campbell is the breakout star here, but each member of the cast brings their all, especially when they are being molested by trees or demonically possessed. Also, I found out that the making of this film is insane. Evil Dead II is when it’s starts to get a little bit silly in nature (and look into why EDII is somewhat odd compared to the first). You should be fine watching it.